Naples Heritage is a luxurious and comfortable golfing community east of Naples and south of I-75 and Davis Road. The gated entry is just two miles southwest of I-75 Exit 111. 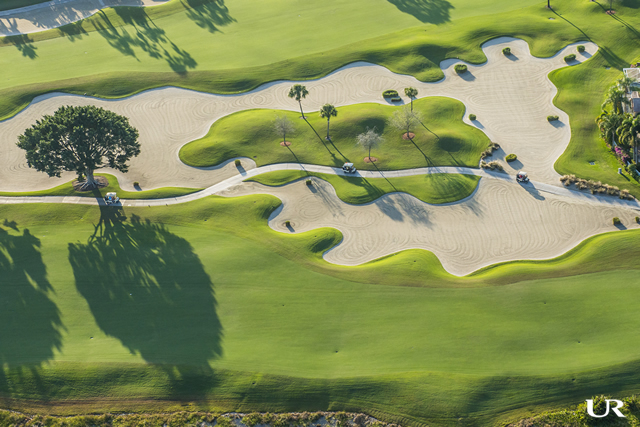 Naples Heritage is a neighbor to Cedar Hammock and Naples National Golf and Country Clubs. Naples Heritage sits on 550 acres of land, of which 350 acres are nature preserves. The community has another 80 acres of lakes that shimmer under the Southwest Florida sun. The 18-hole, Gordon Lewis championship golf course meanders throughout the property which is home to 101 single-family homes, 140 villas, 270 terrace homes, and 288 veranda homes distributed throughout eight neighborhoods. The neighborhoods of Arbor Lakes, Prestwick, and Stoneybrook are home to three different models of terrace and veranda-style condominiums, ranging in size from 1,200 to 1,400 square feet. The condos in Stoneybrook are in three four-story buildings along a dense preserve buffer that extends half-a-mile east. Each two-bedroom, two-bath condo has a view of the entire 7th fairway across a large lake. The Prestwick neighborhood has two four-story buildings with covered parking, similar to those in Stoneybrook and four two-story buildings with detached garages. Prestwick residents have a lake view across which the 11th or 12th fairways can be seen, depending on the condo location. Arbor Lakes is a neighborhood on a cul-de-sac, as is its neighbor, Stoneybrook, with lake views. Southernmost condos in the neighborhood overlook the 6th fairway and green. The northernmost units can see a portion of the par-five eighth hole. Glen Abbey and Kilkenny are neighborhoods of attached villa homes. Glen Abbey is home to 60 attached villas along Naples Heritage Drive. Half have a view of the 13th fairway while the other half overlook the 14th and 15th fairways. Glen Abbey II is one of the smallest neighborhoods in the Naples Heritage community with 14 two-bedroom-plus-den residences. Each home in Glen Abbey has a private, screened-in pool. Glen Abbey is along the north side of the 10th fairway. The 66 units in Kilkenny built in 1998 and 1999 are two-bedroom-plus-den with about 1,700 to 1,750 square feet. Homes in both neighborhoods include attached, two-car garages. Heritage Links is an intimate, cul-de-sac neighborhood of 72 veranda homes in two-story buildings. Floor plans range from 1,333 to 1,664 square feet. Each residence has a single-car garage. Southern Links, which overlooks the 16th and 17th fairways, consists of eleven two-story buildings with twelve units each. Each unit has a detached, single-car garage. The two-bedroom-plus-den floor plans range in size from 1,400 square feet to over 1,600 square feet. Cypress Pointe at Naples Heritage is comprised of detached villas and single-family homes ranging from 2,000 to more than 3,500 square feet. Eighteen classic models grace Naples Heritage Drive along the 2nd, 3rd, 4th and 5th fairways. The 15,000 square foot clubhouse features all the expected amenities, including a large, resort-style pool, four lighted tennis courts, and sumptuous meals in the dining areas. Other tennis courts and pools are available in the various neighborhoods. The Naples Heritage lifestyle is super. The Naples beaches are only six miles west on Davis Boulevard. Tin City and the Fifth Avenue Shops are en route. Students living in Naples Heritage attend either Calusa Park Elementary, East Naples Middle or Lely High School, the home of the Trojans. Lely High School has produced two NFL players, two tennis pros, and an Olympic swimmer.